Click to see our 2018 Newsletter!! Click to see our latest News Feeds! Imaging, Evaluation, and Treatment (I-EaT) of Swallowing Research Laboratory at Purdue University! The Purdue I-EaT Swallowing Research Lab is under the direction of Associate Professor, Georgia A. Malandraki. The faculty and staff of our lab are dedicated to high-level basic and clinical research and to improving the health and quality of life of children and adults with swallowing disorders (also known as dysphagia). Our research is currently supported by the NIH, National Institute on Deafness and Other Communication Disorders (NIDCD), the American Academy of Cerebral Palsy and Developmental Medicine and the Pedal-with-Pete Foundation, the Ralph W. and Grace M. Showalter Research Trust, and the Indiana Clinical and Translational Sciences Institute (CTSI) and the Women's Global Health Initiative. 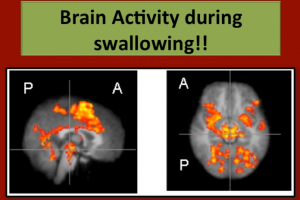 The research conducted in our lab focuses on: a) the use of advanced imaging to understand the neural underpinnings of swallowing in the normal population and following neurological trauma or intervention, b) developing and evaluating new neurorehabilitation interventions for neurogenic dysphagia, and c) the development and validation of telehealth systems to test the effectiveness of providing swallowing rehabilitation from a distance. Our laboratory (housed in two dedicated and one shared spaces within Lyles-Porter Hall) includes four fully-equipped MRI/fMRI analysis workstations, high quality electromyographic and respiratory physiology recording and analysis equipment, and multiple swallowing diagnostic and intervention tools, including a high quality FEES station (KayPentax Swallowing Workstation) and two flexible endoscopes. We are also excited to announce that our lab recently acquired a videofluoroscopic c-arm (OEC 9800 Plus Digital Mobile 12" GE) that allows real-time high quality videofluoroscopic data acquisition, making us one of the first research laboratories (outside a medical setting) in the US that has the capability to conduct videofluoroscopic swallowing studies. 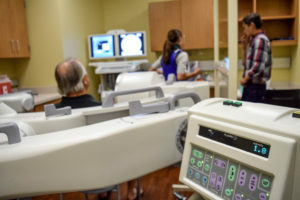 The Purdue I-EaT Swallowing Research Laboratory operates in partnership with the Purdue I-EaT Swallowing Research Clinic of the M.D. Steer Speech and Language Clinic, one of the first dedicated University-based dysphagia clinics in the country. The Purdue I-EaT Laboratory’s main research affiliations include: the Center for Cerebral Palsy Research at Teachers College, Columbia University, New York, the Purdue Institute for Integrative Neuroscience, the Purdue Life Science MRI Facility, the Purdue Soft Bioelectronics Laboratory, the Purdue Center for Research on Brain, Behavior and NeuroRehabilitation (CEREBBRAL), the Purdue Saliva, Perception, Ingestion, and Tongues (SPIT) Laboratory, the Nationwide Children’s Hospital (Interdisciplinary Feeding Clinic), in Columbus, Ohio, and the University Hospital Evangelismos in Athens, Greece. If you have trouble accessing this page because of a disability, please contact Purdue I-Eat Research Lab at malandraki@purdue.edu.